I am so excited to share that I have a selection of Fickle Knitter patterns being released through the Knit Point Online Pattern Shop coming up December 15th with JKnit! 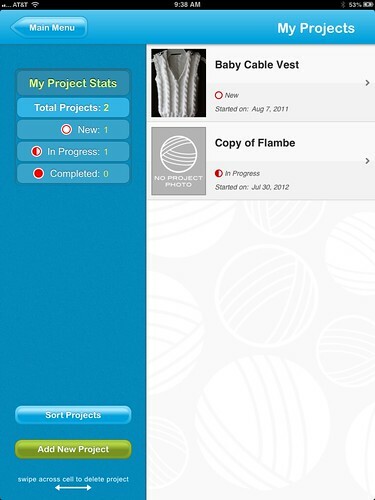 JKnit is a wonderful app for knitting patterns and is owned and operated by a husband and wife team, Julia and Armen Kroyan. In honor of the upcoming pattern release I thought I’d introduce you to some of my favorite aspects of using JKnit while I’m knitting. There is a free version and a paid version for both iPhone and iPad, and the free version has nearly all of the functionality as the paid version which is pretty incredible! 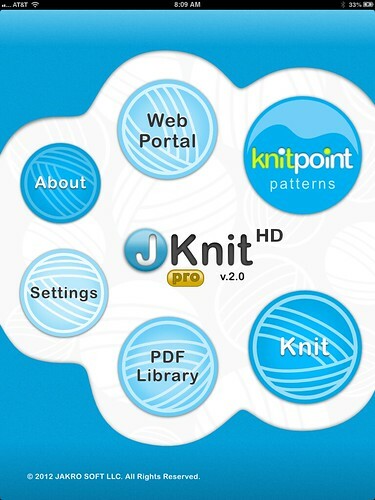 I’m going to list out the things that I use JKnit for, with some screen shots to show you how powerful this app is when applied to your knitting patterns. At this time there is no android equivalent, but I feel that the app is a nice justification to snap up that iPad Mini you’ve had your eye on all season. (And by you, I mean me). 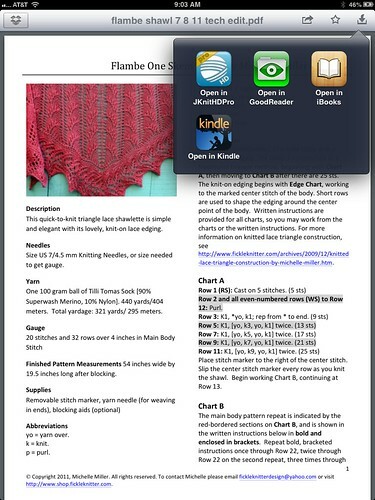 All screen grabs are from my iPad and the Pro version of Jknit. 1. 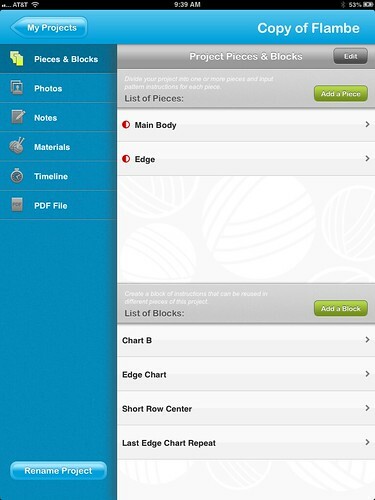 You can upload your pattern PDFs. 2. You can use the yellow highlight bar to work through the pattern line by line. 3. 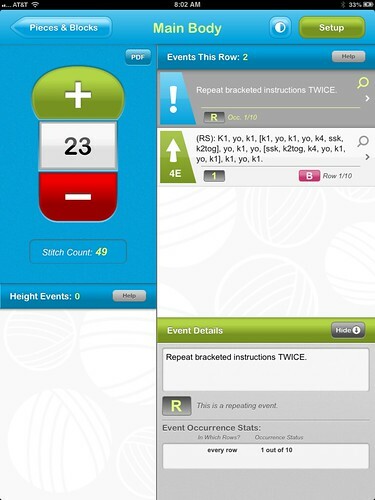 Using the pro version or by purchasing your pattern at Knit Point, you can step through your patterns line by line using the row counter on both the paid and pro versions of the app. I use dropbox religiously to back up my work, so it’s a simple matter to transfer my PDFs to JKnit. Step 1: Open your pattern in Dropbox and click the top right hand icon (it looks like an arrow pointing into a box). Step 2: Click “Open in” and Select JKnit. Once your pattern is open in JKnit 2. You can use the yellow highlight bar to work through the pattern line by line! This is the screen shot of the pattern after opening it in JKnit and using the yellow highlight bar is very simple. To view the yellow highlight bar simply click the “Bar Show” icon in the top right. After clicking, the yellow highlight bar pops up automatically in the middle of the page. To move the yellow highlight bar around your PDF in a meaningful way you’ll need to click “Edit Bar,” the icon second from the top left of the JKnit screen. I reduced the yellow bar width from 40 to 32 (using the minus triangle button) and lined the bar up with the first row of the pattern. Next all you have to do is simply move the bar up and down as you work your way through the pattern. Moving the bar around is fairly simple, tap on it and drag it with your finger tip to the right location. What’s especially nice is that these techniques can be used on any Knitting pattern PDF and this functionality is available in the FREE JKnit version as well as the Pro JKnit version. Here’s a screen grab that shows how easily you can keep your place on a chart by using the techniques described above in the using the yellow highlight bar to work through the pattern. I prefer to work from charts, so this is the technique that I use most often. 3. Using the pro version or by purchasing your pattern at Knit Point, you can step through your patterns line by line using the row counter. Let’s move on to stepping through knitting patterns line by line using JKnit. This applies to the free and paid versions of the app. The beauty of the Knit Point Online Pattern Shop is that all of the patterns for sale there have been entered into JKnit so that you can step through the patterns LINE BY LINE. 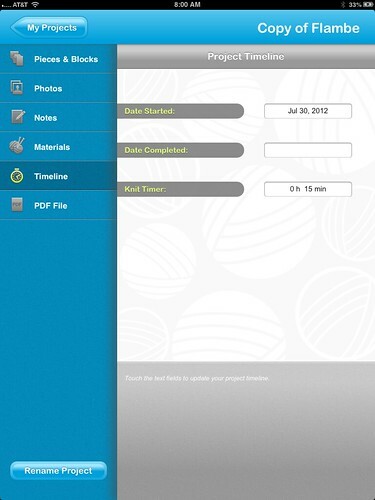 This functionality is available for the Free and Paid version of the app as well. I’m not going to show you how to enter a pattern by hand into the line by line row section right now, let’s leave that tutorial for another time. 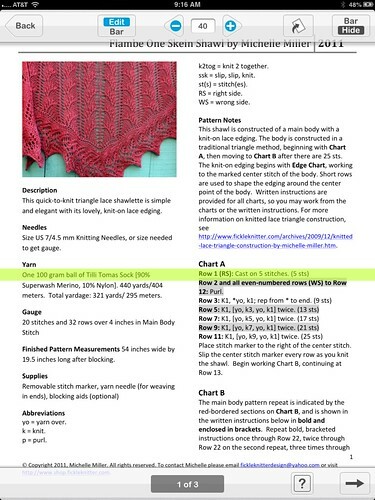 That means that #3 refers to patterns purchased through Knit Point only. So what does stepping through a Knit Point pattern line by line mean anyway? Let’s take a look! 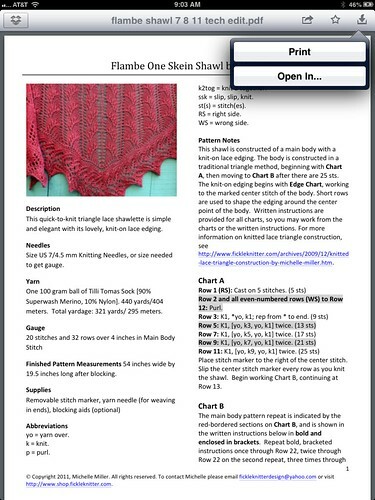 A pattern purchased through Knit Point and entered into the line by line functionality of the JKnit app has all of the same information as the Pattern PDF (which is included as part of your purchase). 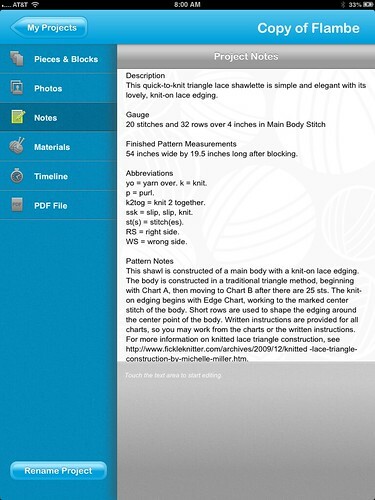 You can view the Pattern Notes, abbreviations, gauge, and finished measurements. 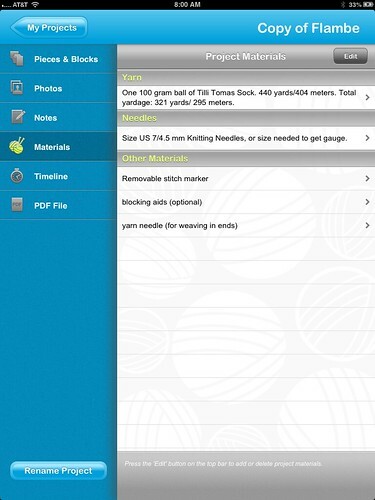 You can also see Yarn and Knitting Needle requirements, and other necessary materials. Another nice feature is to be able to see the date you started knitting and the amount of time you’ve used JKnit to work through that particular pattern. Once you have admired all of the notes and information supplied about your pattern, and done your gauge swatch (because everybody does that, right? ), you are ready to start knitting! Once you do that you’ll see the patterns available to knit that you’ve purchased from Knit Point. Select the pattern you wish to knit. For this project our choices are “Main Body” and “Edge” and since Flambe is a Top-Down Shawl with a knit on edge you’ll select “Main Body” to begin. Amazingly the pattern is all queued up and ready to go! Your instructions are under “Event Details” and prompt you to Cast on 5 stitches. Once you’ve done that. click the + icon that appears above the number one. Then once you’ve completed Row 2, click the plus sign again to advance the pattern one row. You’ll keep working line by line through each instruction in the pattern. As you keep going, you’ll note that the screen under the row counter indicates how many stitches you should have! This is particularly useful as you work repeats of the same instructions in blocks. I like how the second repeat of Chart B has the instruction to work the section inside the brackets twice. What a great way to jog your memory! I hope that you’ve enjoyed my introduction and tutorial to the JKnit iPhone and iPad app! I’m not a paid endorser of the app, I just happen to love it. 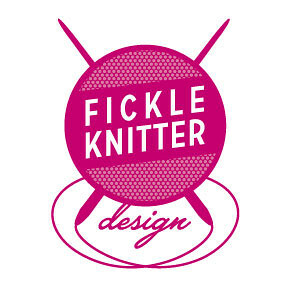 On December 15th Knit Point Online Shop will debut a nice selection of Fickle Knitter Design patterns. Each pattern for sale at Knit Point will allow you to step through the my patterns line by line, or use the yellow highlight bar with the PDF if you prefer to work through my patterns that way. Please check back, because I have another exciting collaboration with JKnit coming up! I’ll give you a hint, it involves a special Mystery Knit Along. More soon.